Inline vs Tapered Crochet Hook: Which is the Best Crochet Hook? Which is the best crochet hook for you? Discover the best crochet hooks to use as we answer the age-old debate on the inline vs tapered crochet hook. The answer to this question may surprise you! Crocheters all have their preferences as to which hook feels better. 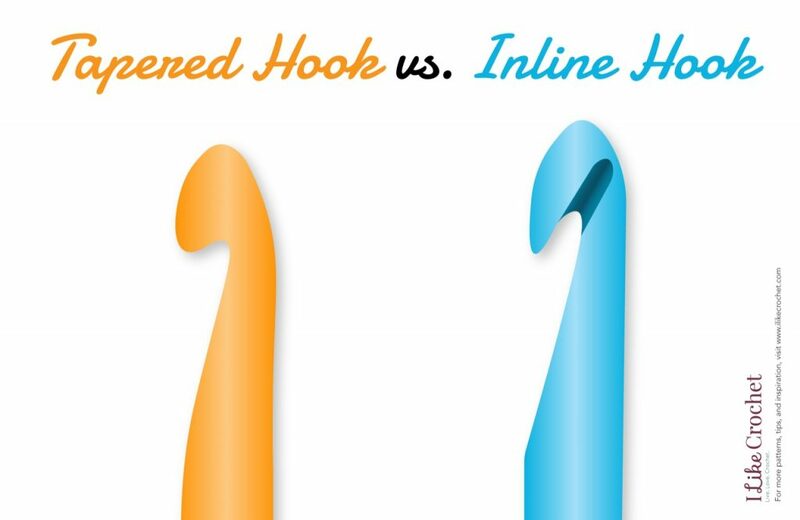 Learn why some people prefer one hook over the other. I’m pretty sure the inline vs tapered crochet hook debate has been going on in the crochet world since the introduction of both hooks. If you delve into the madness, you will find pretty heated arguments for or against each hook style since both have very loyal followers. This hook holds the yarn better! This one is less stress on your wrist! This hook helps you maintain a consistent tension! Someone new to crochet could go crazy reading the pro/con lists before choosing a hook. But I’m going to end this argument once and for all by letting every new crochet artist in on the best kept secret in regards to hook style: it actually doesn’t matter which one you use. Learning crochet really doesn’t have much to do with buying the perfect hook as much as it has to do with muscle memory. The reason you feel so awkward when you start, quite simply, is because your hands are not used to movements. No matter which hook you start with, when you make your very first row of single crochet, you are going to feel like a monkey playing with a stick. But keep working and you’ll find that the very second your hand ‘memorizes’ the motion, your tension will get more consistent, your stitches will become neater, and your finished objects will begin to look amazing. 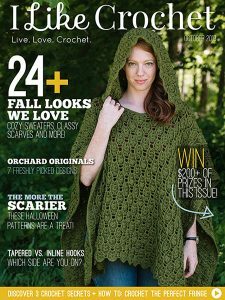 It’s no coincidence that people who advocate so hard for inline vs. tapered just happened to have learned to crochet with one of those hooks. Of course the first hook they picked up and forced themselves to work with through the growing pains of muscle memory is going to be the ‘best’ one. Your hand will adapt to your tools. Not the other way around. So which hook should you choose? To answer that question, I’m going to digress a bit to talk about stitch markers. There was a point in my crochet life where you couldn’t pay me to use a stitch marker. I had different colored pieces of yarn, safety pins and even those plain little rings at the ready, but I just wouldn’t use them. I didn’t want to break my rhythm and I rationalized that I could remember where the stitch marker should be. Well, you can guess what happened next, right? Every single project slanted wrong or didn’t fit or ended up needing to be frogged it was so hopelessly messed up. Still, I wouldn’t use them. THIS time I’ll just remember, I told myself. THIS time I won’t NEED to mark the stitch. I decided to test her theory with my aversion to stitch markers. I ditched all my plain or homemade stitch markers and searched online to find some beautiful crystal charm stitch markers. The change in my crocheting was immediate. I went from avoiding stitch markers like the plague to seeking out patterns specifically so I could use them. Something about seeing those gorgeous crystals dangling delicately from my yarn warmed my heart, so placing them became a joy instead of a chore. Now, let’s return to the question of which hook you should use. And I will answer that question now in the simplest way that I can: pick the hook that you find most aesthetically pleasing. After all, you’ll want to make beautiful things if you use beautiful tools. I’ve just resumed crocheting in the last year and now realize why I prefer one type of hook over the other. I didn’t identify the difference in the hook type until you pointed it out in this article. I did find the longer hooks suited me more in the last month, but I also now see the hook type for me is inline. I’ve upgraded to the Furls Streamline for the length and love the inline hook. Thanks for defining this preference. Justifies the extra dollars in my upgrade as well as the speed and accuracy I’ve gained in this change to new hooks. Nice article! I learned on tapered, but have found that I love the inline. There are some beautiful hand crafted hooks all over the internet. I bought a set that is fairly inexpensive and then bought one hook that cost twice as much as the entire set I previously bought, and found that price does not dictate the “love of the hook”. I love the first set, and the other “expensive” hook I have is making a nice paperweight. 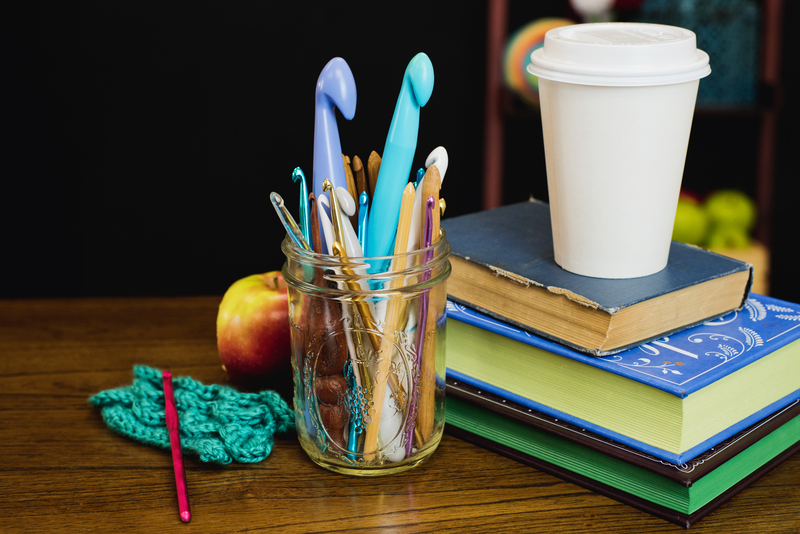 Over the 44 years that I’ve been crocheting and teaching people how to crochet, I have found that there are distinctions that go with the different hooks and how you hold your hook. It’s also not just whether the hook is tapered or inline, there is a difference in the length of the shaft going from the indent for your thumb to rest upon up to the hook. If you learned to crochet as if you’re holding a knife, the inline hook works better for that style because of the swing motion to yarn over (wrapping the yarn over the hook) is a more compact motion — thus a shorter shaft. If you crochet with the hook as if you are writing or holding the hook resting on the outer part of the hand between the thumb and index finger, you will most likely be more comfortable using the tapered hook because the shaft from the thumb resting position to the hook’s tip is of a longer distance to accommodate for a wider swinging of the hook to produce a flowing yarn over. I hope this tidbit of information helps anyone who is struggling with which hook to use. This article is just awesome, thanks for posting! I agree with Mr Burton can the magazine be mailed out prefer to hold it rather than my phone!!! With my subscription can I get the magazines mailed to my address ? Would prefer the magazine mailed to my house.